The Neugebauers: but I did. I took a picture of myself on the rebounder (what the pro-bouncers call their tramps) for your viewing pleasure. 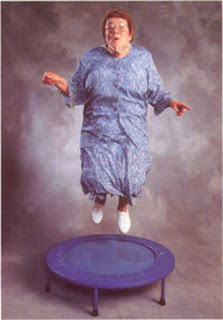 And I've decided to add jumping to my list of things I can do to obtain my goal (thanks to the comments). I still read your blog... on occasion. Sorry I don't comment much. But I DO think this is a fabulous goal! And I like that you are using your blog to keep track of your progress. After I have these babies, I need to find something similar to do. You can be my inspiration! :) Keep up the good work! Thanks, Heidi! It's nice to know people are reading. It helps keep me accountable. And... these BABIES?! As in, more than one? !